Summer is finally in the air. I'm pretty sure I am not the only one who is bouncing around with a grinned face just because the warm weather is here. No more thick, furry and heavy clothes to cover us up and no more boots to wear whenever we need to go outside of the house. Casual Dresses are what most every woman desires to wear this season. Some might have their closets full of new and beautiful dresses and others might just initiate. We don't know, as for me? Well, I do have quite a few of them, in which I am dying to wear this year. 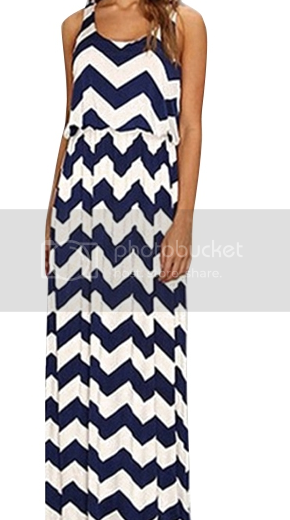 I'd like to wear this pleasing and very relaxing maxi dress this summer. Very affordable and yes! I found this in one of the casual dresses online. What website am I browsing? You can visit the store HERE. You will definitely going to enjoy shopping or window shopping to the varieties of designs they carry on the website. The cost of each item is unbelievably affordable and worth the money to pay, I know cause I saw it with my own two eyes. The best part of shopping at Zaful is that you'll enjoy all the clothing, new arrivals, they have Spring fashion trends to offer and of course always my favorite section SALE. I love their unique collections and you should too, this might the online boutique that you have been seeking for. You might be wondering about the cost of shipping? Well then, don't cause they have FREE shipping worldwide in all of their products. For me, I've always looked for an online website where it carry's free shipping on all their products that way I won't problem about it. Would definitely recommend this website to my sisters and girlfriends, like me I am positive that they will love the website. Check them now and see what you might be eyeing on the website. Pretty dress. It looks really cool and comfortable. Iwould too if I were you, that's a beautiful pattern and style! I love maxi and/or sundresses , casual or in special occasion. I surely will check their site. I wonder how often do they have sale? Nice dress and added to that free shipping. Bagay yan sa anak ko. I've never worn a maxi dress before. I guess it's about time I try one. Gotta check out the website you suggested, sis. Thanks!